Recently, I was given the opportunity to review some bright, colorful chalk markers, from U.S. Bilby. 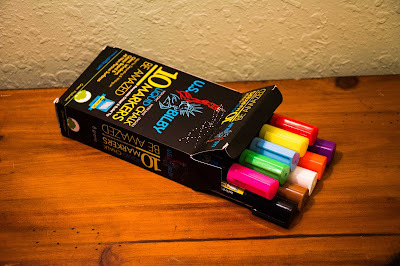 I was really excited to try these out, because I have seen reviews of these markers, and I love how bright they turn out on glass, or chalk boards - So I was really excited to get to try them out for myself. In my family, we like to have fun. We like to decorate year around, especially for holidays, and we also like to mess around with each other, and joke a lot. So my first idea with these markers was to draw a funny pictures of my grandmas car window, so she would get scared, when she saw it (lol.) So I drew a giant bird on her passenger side window, and it actually ended up being more hilarious then I thought. Because she didn't notice the bird right away. We actually went shopping, and she didn't see it when we first got in the car. It wasn't until we got to a red light, and she just happened to look out that window, and panicking, asked me what was on her window. It was so funny, because it really wasn't a well drawn bird, and it just really took her by surprise. Now, we haven't had any holidays since I got these for review, but what I can't wait to do, is decorate our sliding glass door, that leads out to the lanai. Usually, every year, we got some window clings, and decorate the whole glass door with them. This year, I seriously can't wait to draw some fun pictures, and sayings instead. It just makes it more homey, and I really love the way the liquid chalk looks. I also love the wide variety of colors you get in your pack (10 colors) so you have colors for every season, and holiday! I wrote with a few of the different colors, so you could see just how much these colors pop. Aren't they awesome?! I love neons. 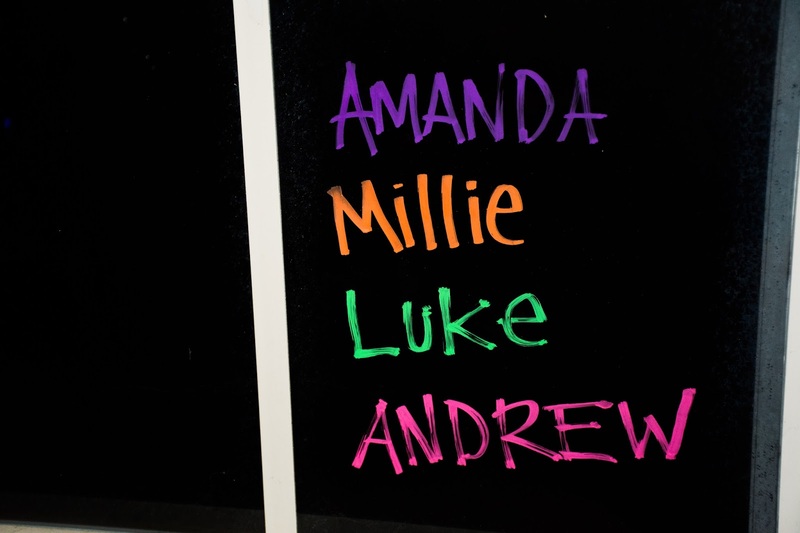 This past year, when I had Millie, I seriously wanted to get a chalk board to do all of her monthly "birthday" pictures with. My friend Monika did that, and she has the cutest photos with her son. Unfortunately, (and this may sound weird) I actually have a phobia of chalk. That smooth texture on regular pieces of school chalk, really just makes my skin crawl. I literally cannot bring myself to use chalk. So these chalk markers are a life saver for me. I am investing in a small chalk board soon, so when I have my little boy in November, I can get some really great pictures of him every month. 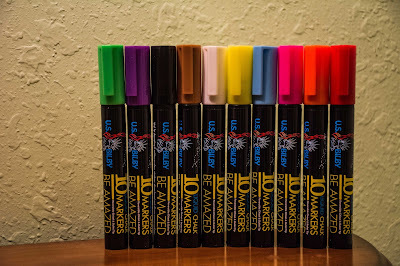 Now, the thing with these markers, is that it is very important to follow the instructions very closely, to ensure you get them working properly, and effectively.The instructions are really simple (3 super easy steps) but if you don't follow them - It will take you a lot longer to get them working. If you follow the instructions, it only takes about 1 minute, per marker, if even. Overall, I am very happy with my first attempt at using chalk markers. U.S. Bilby has really great ones, and I'd imagine it would be hard to have a better chalk marker, then these. There will actually be 2 lucky winners for this giveaway. The first winner will receive a beautiful chocolate gift basket, and the second winner will receive a set of the U.S. Bilby chalk markers. Disclosure: I received compensation in exchange for this review. All opinions expressed within this post are my own, and were not influenced in any way. Must be 18 years of age or older to enter this giveaway. This giveaway starts August 15th, 2016, and will end on August 29th, 2016 at 11:59 pm. The winner will be emailed, and have 48 hours to respond, or a new winner will be chosen. Once a winner is drawn and confirmed, the name will be announced on the GiveawayTools form. My favorite color is the PINK. I love the purple marker. I like Blue..always a favorite color. All of the colors are cool and yes they popped big time. I think my favorite is the pink! My favorite is that green. Love it! My favorite color marker? I'm all about the green. I like the pink the best. I love the hot pink. they are all pretty cool though the way they show up on the black background. I like the Purple color the best. Love these Markers...thanks for this chance! The U.S. Bilby Chalk Marker's look great. I never thought that chalk could be so dark. I love the neon green and pink. They would get a lot of use at my house. If I am not babysitting my grandkids are here. I have a playschool chalk board that they draw on, but the colors are so bland. My favorite color is the orange one. I love how bright these colors are. I like the purple marker best. Of the colors in this assortment, the blue color is my favorite. I like the pink marker. My fave is the lime green. I think my favorite would be the light blue. 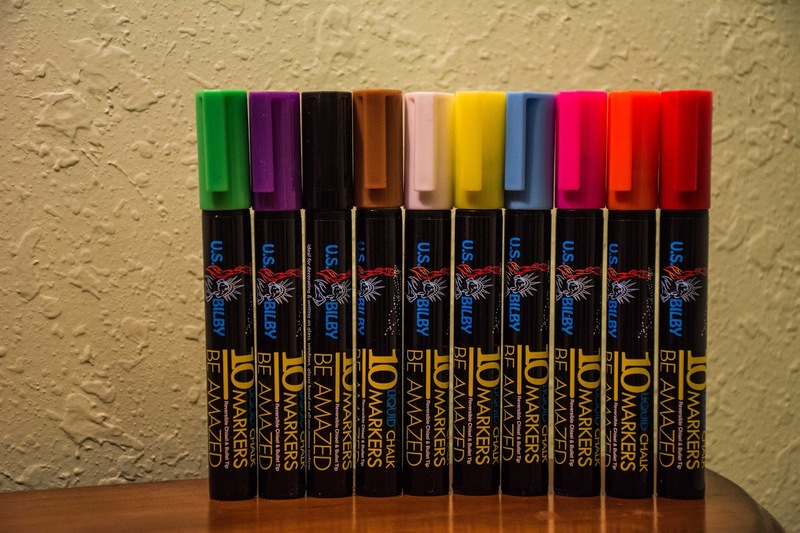 These markers look like fun! 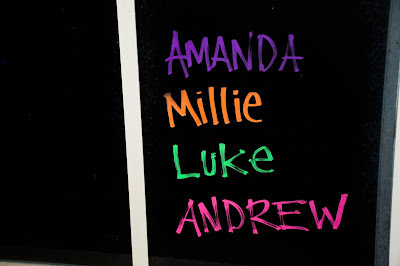 I just recently gave a great liquid chalkboard to a new store that opened (we were loyal customers at their old location for decades). They loved and already used up some of the markers on their first collages to advertise! So looking for more like these. Wold be great!!!! The one that ran out first was the WHITE, so thei one that is off white you have (can't tell if it is a light pink), would perhaps be a favorite. Thanks! I like the light blue chalk marker the most. They all are nice and bright. I especially like the neon orange. I love all the colors. But my favorite would be green. I love the green! Nice and bright! I really like the green marker. I like the orange! It pops out on the word Millie in your review. I like the green color best.